Malaysian Ex-Prime Minister Sued in Corruption Case. In Malaysia, former Prime Minister Najib Razak has been formally charged with a large-scale corruption case, published by Express Paper. Najib, who was head of government from 2009 to 2018, is accused of eclipsing about $ 4.5 billion from the 1MDB government investment fund, of which nearly $ 700 million would have gone to his bank account. Najib had to appear before the court in Kuala Lumpur. He charged him three times with abuse of trust and one charge of abuse of power. For each of the charges a maximum penalty of 20 years in prison applies. His lawyer condemns the court’s decision as “political revenge”. The 64-year-old Najib surprisingly lost on 9 May the elections of his former mentor and former prime minister (1981-2003) Mahathir Mohamad (92). During the campaign, Mahathir Najib continually attacked the corruption scandal around 1MDB. After his victory, the new prime minister set up a task force to investigate the accusations. It took up almost 300 million dollars in cash, jewellery, watches, handbags and other luxury goods in the private homes of Najib. Also, Najib’s wife Rosmah Mansor (66) was questioned last month about her involvement in the scandal. 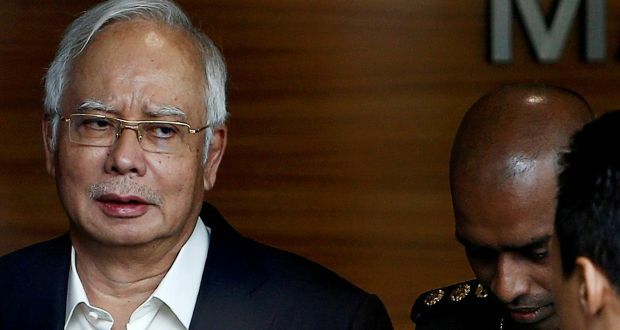 The interrogation would be about 42 million ringgit (10.6 million dollars) that was transferred from SRC International, a former subsidiary of 1MDB, to Najib’s bank account. Yesterday Najib’s stepson Riza Aziz was interviewed, co-founder of the film company that produced ‘The Wolf of Wall Street’ by Martin Scorsese in 2013. In the United States, Switzerland, Indonesia, Singapore and Hong Kong, studies into 1MDB were started.